Home / #Chronicles / #US / #USChronicles / #USLocal / #WeatherAlarm / #US.#Chronicles : Invasion of tumbleweeds in Southern California due to heavy winds ! 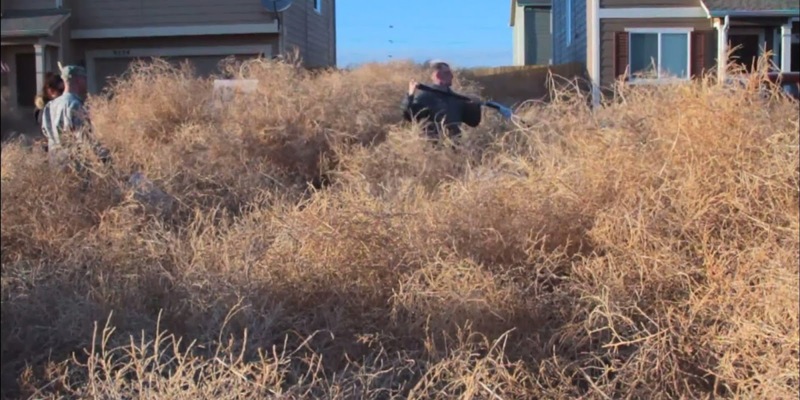 #US.#Chronicles : Invasion of tumbleweeds in Southern California due to heavy winds ! Heavy winds have caused a Southern California town to become deluged with tumbleweeds. In Victorville, Calif., tumbleweeds accumulated so much, entire driveways and front sides of homes were covered in the dry, detached diaspores. "Normally you get a few flying down the street or whatnot, but never this many that will stack up even this much," Victorville resident Tanya Speight told KABC-TV, referring to the hill of tumbleweeds in front of her home. "And this is mild compared to what it was actually in the back yard and in the front of the house. So no, it's never been this bad." Victorville spokeswoman Sue Jones told the Victorville Daily Press that approximately 100 to 150 homes were submerged in tumbleweeds. In recent days, winds as high as 60 mph hit the area, bringing in the flood of tumbleweeds from dry, open fields nearby. Clean-up crews were called in to alleviate the problem, but the winds have continued, prolonging the problem. "The primary goal is to clear the front of the houses, to remove the tumbleweeds in order to allow residents safe access to their homes," Jones said. "With the winds as strong as they are, as soon as they clear certain areas, more tumbleweeds are blowing right back in."